Nowadays when a cinema is noteworthy enough to be singled out for special editorial coverage it is usually due to extenuating circumstances or to highlight unique amenities. A brand new multiplex opening in a desirable urban setting, sure. Likewise, the shuttering of a historic movie palace which may not have projected a frame of film in decades. The addition of cutting-edge projection, a premium large format renovation or the latest in-theatre dining concept are also good bets for scoring a feature article in a trade publication such as Celluloid Junkie. A threadbare nine-screen multiplex with mostly tiny auditoriums in a seaside resort town wouldn’t ordinarily warrant ink, virtual or otherwise. Yet, for two weeks each year the Cinéma Olympia in Cannes becomes one of the most important movie theatres in the entire world when it hosts screenings for the Marché du Film in conjunction and alongside the Cannes Film Festival. One of the most important annual film markets to be held anywhere in the world, attendees of the Marché du Film number in the tens of thousands with eager producers looking to sell their latest productions to global distributors. While producers with movies in the script stage can often presell titles to certain territories in order to raise their production budgets, if a film is actually complete, then it is screened for buyers during the Marché. Over the years the definition of a Marché “screening” has evolved as technology allowed sales agents to show acquisitions executives a movie on VHS, or DVD and presently on a mobile device. Traditionally however, a Marché screening means your movie is being projected in an actual theatre or screening room, be it a the Palais des Festival, where the Cannes Film Festival officially takes place, or in one of the existing cinemas in Cannes, the Riviera town from which the renown festival draws its name. 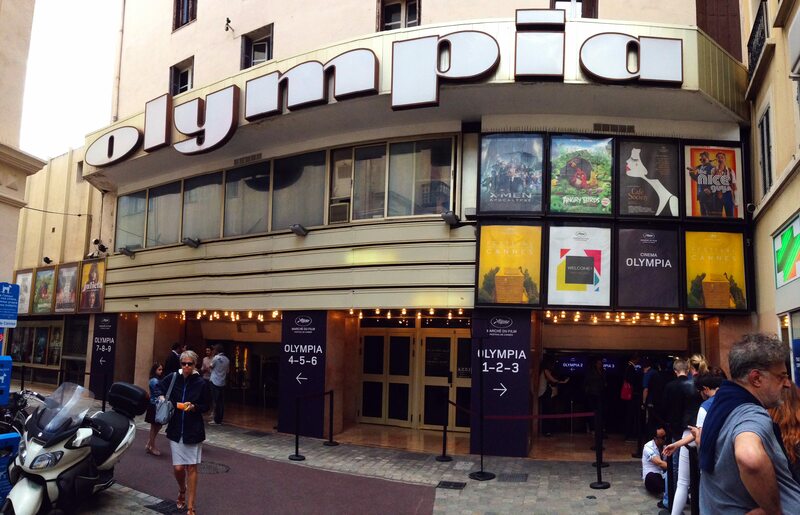 That’s where the Cinéma Olympia plays an important role, hosting 400 screenings over 10 days. Until this year, there were three multiplexes in Cannes; the Star, Les Arcades and of course the Olympia. All are located within walking distance of one another in the heart of Cannes, on or near its high street, the Rue d’Antibes. In January of this year, the four-screen Star closed after its owner clashed with the landlord of increased rent. That made screening space during the Marché even more precious increasing the importance of the Olympia, which houses nine of the markets 34 screening rooms. Located on a short narrow side street named Rue de la Pompe, the Olympia isn’t exactly easy to find for those attending Cannes for the first time. Thanks to the cavernous alley in which it resides, it’s practically impossible to take a good picture of the theatre marquis without photographic trickery. Trust us, we tried on more than one occasion during this year’s festival. The facade is always either half bathed in bright sunlight or falls entirely into the shadow of the buildings surrounding it. During the festival, which takes place over 12 days each May, long lines of acquisitions executives (or “buyers” as they are commonly referred to) are often spotted stretching from the Olympia’s entrance and eventually spilling out onto the sidewalk of the Rue d’Antibes. Lines form early and often for screenings of movies that have generated buzz, as the auditoriums at the Olympia aren’t very big. Each of the auditoriums in the maze-like multi-floor cinema are scheduled and referred to by attendees by their numbers. In total, the Olympia has 1,200 seats. Olympia 1 is the largest screen, at 30 feet (10 meters) wide and has 320 seats and Olympia 2 has 252 seats and Olympia 8 maxes out at 127. The smallest auditorium is Olympia 6 with 68 seats while most of the other rooms have between 72 and 82 seats and screen sizes that range from 12 to 24 feet (3.9 to 8.2 meters). These are not exactly the biggest screenings rooms you’ll ever see, but they are some of the largest in Cannes. The largest auditorium in the Palais has 147 seats, but most resemble the smallest room at 34 seats. Nor are any of the auditoriums at the Olympia all that plush, in the premium sense of the word. To be sure, the seats in most of the auditoriums are a red velour rocker, but absent are the recliners that have become all the rage among cinema operators. Cup holders were also not present. However, all of the auditoriums at the Olympia (and the Marché) utilize digital projection with 5.1 surround sound. Olympia 1 has recently been outfitted with Dolby Atmos. On the other hand, a two hour screening at the Olympia during the Marché will set you back between EUR €1,153 and EUR €2,040 (USD $1,295 and USD $2,291), making it the most expensive screening facility in Cannes. That said, you’re screening is guaranteed to come off without a hitch. In the weeks leading up to the festival the Commission Supérieure Technique de l’image et du Son (CST), along with technicians from Dolby, thoroughly test each auditorium in preparation for the event. As well, projectionists from all over French Riviera turn up at the Olympia during the Marché to assist in pulling off all the screenings. The theatre ordinarily employees three projectionists throughout the rest of the year among its 14 employees. When the Olympia isn’t playing host to distributors and movie stars for world premieres of films from around the globe, it screens the latest Hollywood blockbusters and popular French releases. Like the city of Cannes itself, its busiest time of year is the summer holiday season from May through September. The theatre took in EUR €1.1 million (USD $1.24 million) in revenue during 2015. The Olympia originally opened in the early 1920s as the Majestic taking over space that was originally used as warehouses for grain and flour. Cinéma Olympia is independently owned and has been operated by the Aubert family for generations starting with Vincent Aubert. When Vincent died in 1956 his son Raoul Aubert took over. Raoul passed away in December 2014 and his daughter Brigitte now operates the Olympia, along with Varietes and the Rialto in nearby Nice, Capitole Studios in Avignon as well as Le Chambord and Le Prado in Marseille. Despite her family’s long cinematic history, motion picture exhibition may be a bit of a sideline from Brigitte Aubert’s first occupation as an author of crime detective novels. 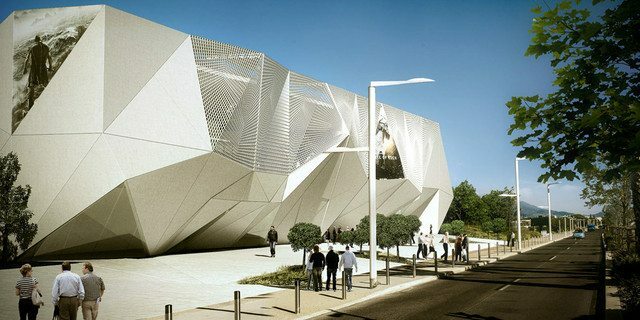 An artists rendering of the new multiplex being built by architect Rudy Ricciotti in Cannes La Bocca, France. She may be taking her role as a cinema owner more seriously these days though, for she has teamed up with the proprietor of Les Arcades on a project to build a modern 12-screen multiplex in Cannes La Bocca, just west of Cannes. Aubert and her partner beat out UGC and Gaumont Pathé to win approval for the new cinema which is set to open in 2018. When it does it will no doubt become a point of focus for film buyers from all over the world for two weeks of the year and a fairly popular multiplex for the remaining 50 weeks. Per a comment left by Brigitte Aubert, this post has been amended to remove reference to Louis Aubert who is of no relation to the Aubert family that has owned and operated Cinéma Olympia for well over half a century.